I would like to introduce you to Teresa. I'm sure the two of you will get along great! "Hi to all you Joy's Hope readers! My name is Teresa and I live happily in beautiful Greensboro, NC with my husband Eric and our gorgeous, silly, fearless 10-month old little girl, Emma. By day I work as a communications director for a large church. And under the cover of night, while the little one sleeps, I enjoy coming up with fun, affordable stationary and paper goods - called Good Day Designs. My Etsy shop, The Good Day Shop, is your place for finding some fun things that will hopefully help make everyday a good day. What could be better than getting (and giving) a handwritten note or handing out a brightly colored calling card to a new friend! 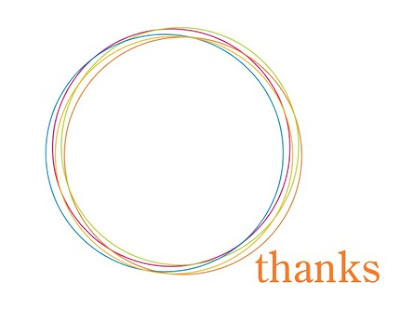 Thanks for looking around - I hope you see something you like - and for welcoming me here at Joy's Hope for the day. Blessings to you all - for a GOOD DAY!" when I grown up I want to be a graphic designer. Good Day Designs to make me look like I am one. considering using the name Carson for a boy. It was the only name on the list. This made the church secretary cry. I would love to send out this gorgeous announcement. I love me some stars. and stripes. 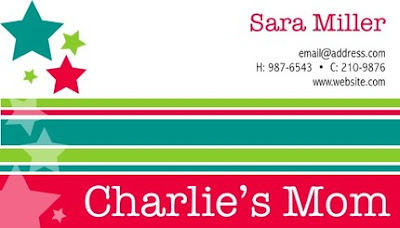 Wouldn't you love to be Charlie's mom? if she had these cards back in the day! Or how funny would it be if she had them right now! She still is my mom! Teresa had me at Rachel Hill. So lets just say that you are shy and dorky like me. Pretend that you fear the "meet the other mothers in your child's class" each year. 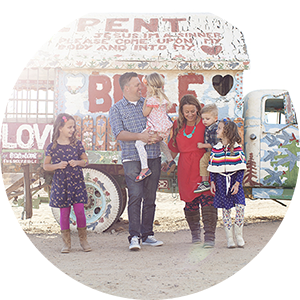 Think about how much easier it would be and cooler you would look with your very own set of personalized Mommy Calling Cards. Teresa will make one winner their own custom set of 50 cards. That means that you will have an instant "momterage" of 50 new friends. Who wouldn't love that at the beginning of a school year! How can you get super popular? 1. Visit The Good Day Shop. Come back here and tell me your favorite design. 2. Follow Teresa on Twitter. 3. Guess why the church secretary cried. 4. Blog/ tweet/ facebook about the giveaway. 5. Make a purchase from Teresa's shop. I know the first day of school will be much easier thanks to you! i just love the "bird family" design! Did she cry because she hated the name, or that you only had a boy's name chosen?! I love the name! Just posted a comment and clicked to follow on Twitter! I LOVE the Modern Cuteness cards in either pink or lime green. I'm not a mom but I'm interning in a school right now and these would be perfect for parents... and full-time job interviews!!! I hope I win! My guess for why the secretary cried... She wanted to use that name or someone with that name close to her passed away? Those are probably terrible guesses. I love the red white and blue and the family bird design. My son starts first grade this year and that would be fun to give out. Isn't your last name Carson? That would cause a secratary to cry maybe?! Funny! I LOVE the good day bird cards! I would want a blue bird though because I have a sweet boy! Carson is your last name too! That would make the church secretary cry! I love the stars and stripes calling cards. My daughter is starting nursery school next month, they'd come in handy for new playdates! I totally big fat puffy heart the Modern Elegance Mommy Calling Cards!!!!!! Hope I get picked to win!!! I love the mom calling cards idea. I have a horrible time remembering names and it would be awesome to have some to give to others. I like the simple modern design. Good Day Bird is my favorite. Love it! Haha, is Carson really your last name? I was going to guess something tragic, like the loss of a precious baby boy named Carson or something like that. I like Carson Carson. LOL! I love the Sweetness Mommy Calling Cards! I love the modern cuteness or modern elegance design! she cried because it was her announcement? I think I'd go with the Stars and Stripes cards! Such cute stuff! I think I'll be making a purchase from her in the near future! I follow now on Twitter too! I'm following on twitter...but as for the secretary I think she cried because her last name was Carson and she was overcome thinking you were naming your son after her family?!? Just a guess! Love GoodDay Designs...I'm totally going to heart her shop on Etsy! Love the Colorful Bubbles Custom Calling Cards...in Purple naturally! :) Everything is super cute in her shop hard to choose! I love the sweetness mommy calling card.....this really is a great idea! Such a fun idea!! I think I like "Modern Elegance Mom" What a creative lady! I think my favorites are modern cuteness and bird family. So...my guess...she had never heard the name before recently but yours is the third...fourth...whatever...that she heard that week. She laughed so hard that she cried. hey julie...just so you don't feel alone...i feel the same way about meeting the moms...or anyone for that matter. this is really cute stuff! My favorite is the modern cuteness custom calling card! Those are all sooo cute! What an excellent idea! Thanks for the chance! Also, Is Carson the name of the church secretary's son??? Just a thought! I LOVE them! 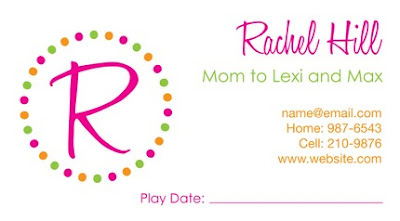 I have been on the hunt for the perfect mommy calling cards! I love the mom and baby bird ones! TOO CUTE! I'm with you. I love the "Dots and Initial" design. I like the red white and blue stars calling cards! I'm guessing she cried because she had a family memeber with that name that something tragic happened too. All these great comments sure make a girl feel great! Thanks for entering, ladies. And Good luck! (Thank to Julie for hosting, of course!) -- Teresa @ GoodDay Designs. I like...This is the Day Note Card Set. Star tagged custom calling cards are my fav! Very cute shop! 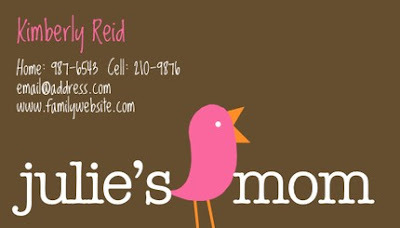 I would love to have a custom calling card made of the 3 little birds with my info and my blog on it. Too Cute! The little family of birds cards are my favorite. So cute! My favorite item is the set of Today is The Day note cards. She has so many adorable items, it was a difficult choice. I love the sweetness cards...so cute! Thanks. Maybe the secretary knew someone w/that name??? Actually my oldest had a kid in his kindergarten class with a double name like that and it was...different. "hi my name is carson carson. nice to meet you"
just a guess. maybe they cried cause they were laughing so hard. Hi! 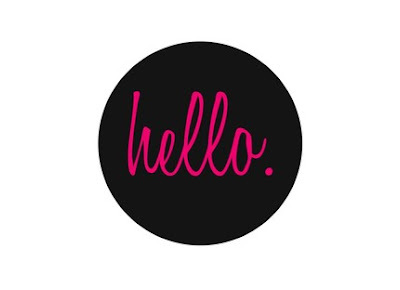 I love the black and pink "hello" cards. I love the birds on a wire calling cards! Ella's mommy is the perfect design for me! I think she cried because Carson is her maiden name. I was first thinking that maybe she had a son Carson that died. That's depressing. Maybe a son Carson that she doesnt get to see often, or is deployed? I love the modern cutie custom. What a cute shop! I like the modern elegance calling cards. They're all great though - thanks for sharing! Hearing the name Carson Carson might make someone laugh until they cried! I bought the bird family calling cards!! I love the modern cutie custom calling cards. I loved the modern cutie calling card! Thanks for a great giveaway! I love the modern elegance mommy calling cards! I love the bird design! SO cute!! I guess that the church secretary has/had a child named Carson. 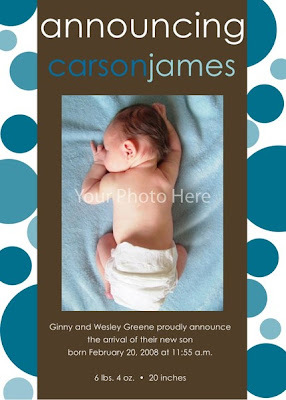 I love the simple sweet birth announcements, super cute things!!! She cried b/c she has always wanted a little boy and has always wanted to name him Carson! I'm following theresa on twitter!! The Mommy Calling Cards are my favorite! I think I might settle on Sweetness...hmmm. Decisions, decisions!